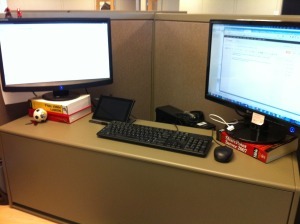 My standing desk, created by cannibalizing my cubicle parts. A few months ago, I switched from my normal sitting desk in my cube to a standing desk. Basically, I accomplished this by pulling one of the overhead cabinets in the cube off and setting it on the desk, and putting my monitors, keyboard, and mouse on top of it. It works really well and my back feels much stronger and more flexible from the constant pressure of having my body supporting its own weight. And it allowed me to move a lot more than I had before. Where I’ve been feeling the pain in the neck. No, my hair is much nicer than this. 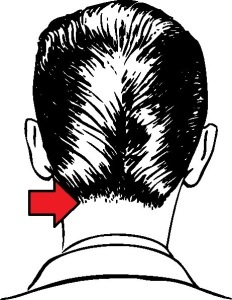 Lately, though, I’ve noticed that I have this kink in my neck. There’s actually a lump in it where I have been getting this pain on occasion. And it’s given me headaches and such on a more than occasional basis of late. I’ve tried rubbing it, doing regular neck exercises such as rolling it, turning it back and forth, every way you can think of (and a couple that probably seem just plain weird). Nothing seems to have fixed it, though. And even this morning I woke up with a headache that I can trace back to my neck. But ever since I finished Go Wild I’ve been reading Move Your DNA: Restore Your Health Through Natural Movement by Katy Bowman, M.S. Katy is a biomechanist who studies how the movements we do throughout the day and even our lives affect the ways our bodies develop. It’s very interesting stuff – the ways our cells expand, contract, provide or relieve load, etc. can have a very massive result on the forms our bodies take. And every movement we make or don’t make has an effect here. That’s a massive understatement, and I hope you’ll check this book out because it’s a masterpiece. But it had me thinking after lunch today, and I decided to make a change to my workstation. Look at the picture of my standing desk/workstation above. Because of where my monitors are, I have to turn my head back and forth fairly robustly to do my work each day, and that was by design (partially – it was also because of how deep that cabinet I cannibalized was). But it occurred to me that I was doing most of my work (I’m a web developer for my day job) on that monitor on the right. And that meant that I was craning my neck to the right most of the day – for the past few months. So just now, I switched up my monitors. Now the monitor where I have my Windows “Start Menu Bar” is on the left. And I’ll be using that monitor for most of my work for the next month or so. Then I’ll switch it back. I’ve set up a calendar to remind me to do so on the first of each month. Just doing this to write up this quick blog is making me feel a bit different in my neck. I won’t say that it’s fixed it, but it’s going to have to be an ongoing pattern to switch it back and forth so that I keep things more balanced. Perhaps I’ll switch it to making the “dominant monitor” change every Monday after a while just to improve the effect. It’s a little N=1 experiment on myself. The takeaway – everything we do has an effect on our bodies in some way. It’s not necessarily negative or positive, but it’s an opportunity for awareness of our bodies. Have you ever fought with workplace-based issues like this? Let us know in the comments!